Could the Next Snowden Be a Robot? The newest game in town for robots is defending themselves from hacking and cybercrime, so say the Financial Times, Forbes, ZD Net, and Information Security, all out with scary articles on the matter. All of the articles base their information on work conducted by the well-known and respected IOActive Labs, which bills itself as a global leader in cybersecurity consultancy. The end result of that effort was the production of a 17-page report: Hacking Robots Before Skynet. What we are seeing here is an identical snapshot in time that harkens directly back to the Millennium, when computers first got rocked by global viruses that knocked out millions of computers and caused billions of dollars in damages. Now it’s the robots turn. Robots, as were computers in 2000, are totally vulnerable. They are easy to hack. And as with computers some 17 years back, robots are going to be the drivers in the launch of a new industry for robot security as well as security for every connected device in the Industrial Internet of Things (IIoT). Macquarie Research reckons that the installed base of industrial robots is ~1.8 million units (about equal to the population of Philadelphia). Cesar Cerrudo, IOActive’s chief technology officer and co-author of Hacking Robots Before Skynet, is concerned that robots are hooked up to the Internet with little or no thought about cybersecurity. Putting data behind such a claim was one of the principle objectives of the IOActive report. It’s an eye-opening, quick read that should be required for anyone who owns or operates an expensive robot working around other expensive machines all the while knocking out expensive products. It’s like dominoes waiting to happen. The seven security challenges from the above list are a starting point for anyone operating even a single industrial robot that is connected in any way to the Internet. Getting an insurer to underwrite industrial robots may well become near-impossible without the robot being hardened to cyber hacking. Plus, from what we’ve learned from the past, cyber-hardened robots are just a logical next step. It’s the future of robots, just as it was the future of computers a decade or so back. “Those who cannot remember the past are condemned to repeat it. Filipino college student, Onel de Guzman, created the now-infamous ILOVEYOU computer virus in his Manilla apartment in 2000. Disguised as a love letter and sent via email, the virus infected 45 million computers worldwide, causing $8.7 billion in damages while costing another $15 billion to remove. Of course, ILOVEYOU was not the first computer virus. The first actually dates back to 1971 with the Creeper Virus that spread using the Advanced Research Projects Agency Network (ARPANET). Yes, ARPANET! The distinction that the ILOVEYOU virus carries is that it is what prompted the rise of today’s anti-virus industry. According to Cybersecurity Ventures, by 2004 the anti-virus industry was about $4 billion; in 2017, it’s expected to be $120 billion. That’s a 35x increase in 13 years. Market Research claims that it will be $170 billion in 2020. And a Gartner forecast put the current tab at about $81 billion. As you can see from the above, no one really knows for sure what the costs are or will be. Real data is hard to come by, so all sorts of numbers are flying around. What is known is that the number is very large and that the defensive spend is growing exponentially. Case in point about the lack of information on cybercrime: It early in 2017 that Yahoo! finally admitted that around 32 million user accounts were accessed by “hackers in the last two years using a sophisticated cookie-forging attack without any password.” It took two years to get that answer from Yahoo! Many times the hacked are silent so as not to let on that they are unable to defend themselves…and ashamed to admit that they were brought to their knees by cyber hooligans. Cerrudo and his fellow expert, Lucas Apa, claim to have uncovered 50 bugs in machines built by six of the biggest robotics manufacturers. When it comes to major manufacturers of industrial robots, six is a huge number, which hints at the possibility that the entire industry was unaware and caught off guard by cyber threats to their products. Hacking Robots Before Skynet claims that hackers could exploit any item on the “bad list” “to spy on users via in-built mics/cameras; use the robot as a stepping stone into the corporate network or the owner’s cloud accounts or even change its behavior in malicious ways. 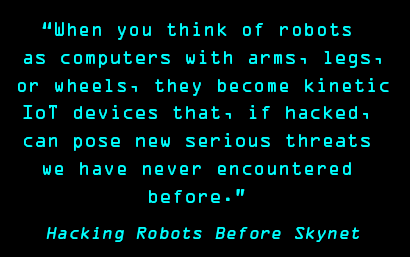 Hence, Hacking Robots Before Skynet made available to one and all as a PDF download. So then, is it possible for a line of hard-working cobots tending CNC milling machines to suddenly go berserk and start tossing stuff around like an Animal House food fight? Yes, seems to be the wider answer from the IOActive report. What then about liabilities, damages, interrupted production schedules, and myriad other possibilities that will fall to insurers of robots to underwrite? “Cyber cover is one of the fastest-growing parts of the insurance world, as a stream of attacks on companies raises the profile of what was once a niche product. Hostage bottling plants, rowdy cobots, and unconcern over robot vulnerabilities, are alarm bells quickly coming of age in this time of rude awakening. A new industry of cyber hardening of robots is on the rise; insurers will probably balk at insuring non-hardened robots; and the automation juggernaut of the Fourth Industrial Revolution has gained an adversary. Lots of smart people building robots and robot software will be working double time to protect the globe’s 1.8 million robots. Lots of smart people gathering together in clandestine groups on the Dark Web will be working to make lots of money by causing havoc. As Redshaw concludes: “This is a target-rich environment that is growing faster than almost anyone anticipated. The bad actors are progressively getting better organized, smarter and better built for “success.” Interpol, the FBI and other law enforcement agencies do great work, but a lot of it is after-the-fact. It’s all shaping up to be nothing short of a clash of titans, who may all wear hoodies like Mr. Robot and be eminently capable of either preserving or taking down a nation’s entire robot workforce.